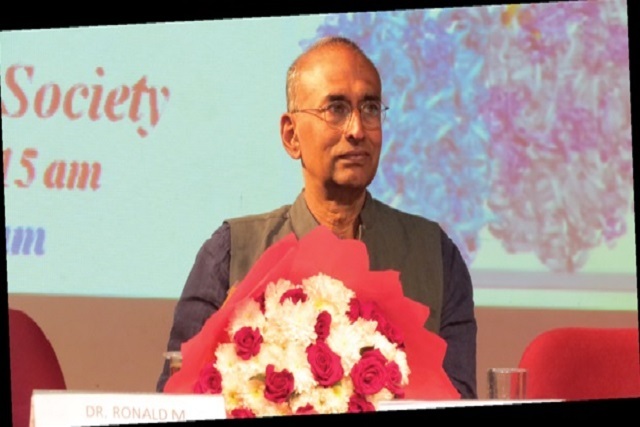 “Learning must be driven by curiosity and passion, not by the lure of rewards.” said Sir Venkatraman Ramakrishnan at St Joseph’s College (Autonomous) on Saturday, January 19 while talking about The Quest for the Structure of the Machine that Reads Our Genes. Venkatraman “Venki” Ramakrishnan, an American and British structural biologist of Indian origin who shared the Nobel Prize in 2009 with Thomas A Steitz and Ada Yonath “for studies of the structure and function of the ribosome,” was the second Nobel laureate to visit the college. Sir CV Raman, who was awarded the Nobel in physics for his work on the scattering of light, had visited the college in 1937. Ramakrishnan’s talk commenced at 10:45 am in the college auditorium, with over 1,700 students, teachers, scientists, research scholars, and invitees in attendance, with live-streaming facilitated in two other halls. He spoke about how despite having a PhD in physics from the University of Ohio he chose to switch to the field of biology since he believed the former would not enable him to make major contributions to the field of science. He emphasised on the importance of understanding the multiple dimensions of human personality. He advised students to always keep their options open, even if it meant learning completely new skills. In his honour, the college this year instituted the annual Nobel Laureate Sir Venkataraman Ramakrishnan Award, to be presented on the College Day to the student showing the highest potential for research in science at the postgraduate level.